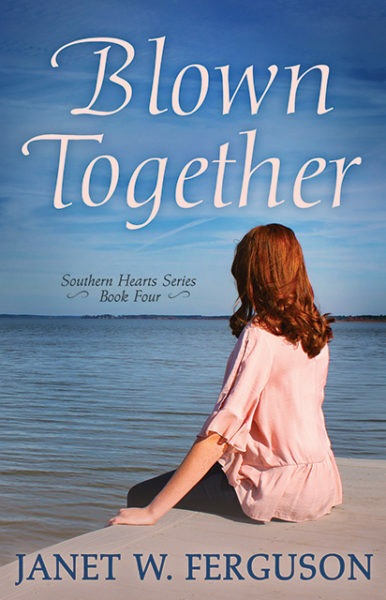 I’m excited to show you the new covers I’m working on for the Southern Hearts Series. We’re halfway there! These are the last two books in the series (I started backwards, ha! ), the first two will be remade in the fall as I’m waiting for the cotton fields to produce their beautiful white bolls. I think the fields would make a good Southern backdrop. Why remake the covers? As many publishers do, big and small, I had covers that were designed with stock photos. Then, it seemed that several other novels were using the same stock photo. I thought it might be confusing for readers, but I wasn’t sure what to do about it. While trying to create a cover for my last novel, Magnolia Storms, a member of my street team suggested I make a photo here in Mississippi with local models. I really thought that would be too expensive, but she suggested a person who had hair like my character and even suggested a friend on the school annual staff to take the pictures. Doubtful, I obliged what I thought would never work out, but we ended up with a beautiful cover! So, do you know the story If You Give a Mouse a Cookie? One thing led to another, and the photographer, Ann Marie McGee, agreed to help me redo my Southern Hearts series covers. I began scoping out my friends, my daughter’s friends, and even thinking of students I had taught years ago at the local high school that could fit my characters’ hair color and general look. Blown Together and Going Up South have redheaded heroines. My friend from church, Elizabeth Thompson, has beautiful red hair and agreed to model. It was a chilly day in January out by a lake, but she did an amazing job! Isn’t her hair fantastic?! 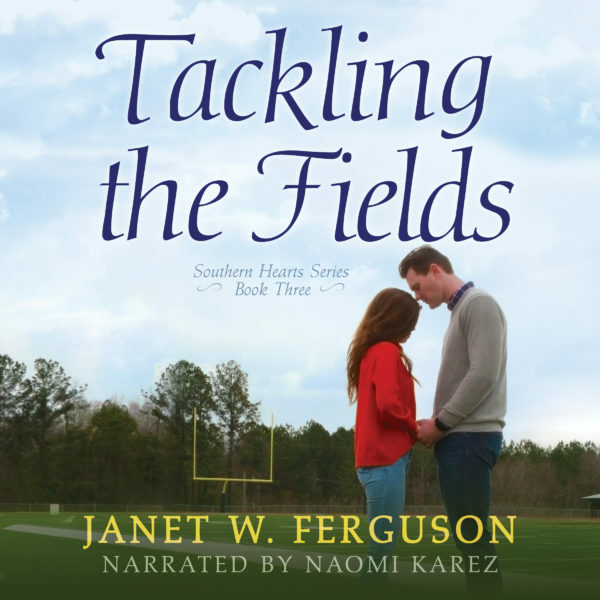 For Tackling the Fields, my daughter’s former roommate,Erin McInnis, agreed to model, along with a young man who had graduated from the high school where I used to work. They had never met, but they were super professional and made a great team! I love how it turned out! Here’s the audio book version. Hi Janet, love your new covers. How great that you could use friends/family/acquaintances to get unique photos to make your covers. Thanks! It’s been so much fun! Hi Janet, I’m so excited about your new covers. So far they are great. I love how you are using people you or someone close know. And speaking of red hair, I have a granddaughter who has beautiful red hair. I’ve always loved a true red headed person. I hope you are getting what you are imagining your covers to be. I would be delighted and excited to win one of your books in video. I like videos. I can still do things around the house while I listen. Good luck with the covers and I look forward to reading your upcoming books. Hi Kathy! I love red hair! I bet it’s beautiful! I’ll put you in for the audio books! Hi Janet! Congrats on your new covers and how the pieces are falling into place. The new covers look fresh and current. No need to include me in the give away. Best wishes and happy creating stories and covers. Hi Renate! Thanks! I’ve been excited about it! Have a great week! Thanks Colleen! Yes, I didn’t realize how much certain pics were reused! Thanks for the cover love! I’ve only tried one audiobook which I didn’t particular care for. But I’m so willing to try again! I love the new covers for the books! I liked the original covers, too, but the new covers bring something fresh to the books. I’m glad you’re willing to try again! I’ll put you in the drawing! Thanks for the kind words! The covers look awesome, Janet! Congrats! No need to enter me, I am not an audio book person, besides, I’ve read all your books!! So happy you like the new ones!! Thank you! I don’t subscribe to Audible so don’t include me in the drawing but I just had to tell you I love the new covers! Fantastic job and fantastic models. Aww! Thank you for being so sweet Sherri!! Thank you, Kim! Have a wonderful day! Congratulations, Janet. The covers look great! Yay! Thanks! Glad you like them! They turned out fabulous and I love the idea of having locals and people you actually know in the covers. So much more meaningful to everyone! Thanks! I thought it was fun, and I think the models thought it was kind of cool, too! I like the new covers! How neat to be able to use people you know. Thanks! Yes, it has been fun to invite people to be on my covers! I love having real people on the covers. I also enjoy listening to audio books at work. Thanks for the giveaway. You’re welcome! I hope you like the stories! Thanks, Priscila! It has been fun hearing the novels come alive in audio! 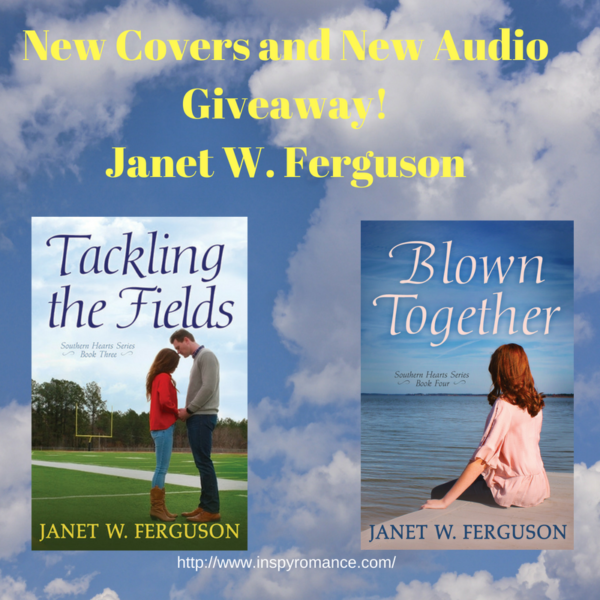 Lovely covers, Janet…what a good idea! Don’t enter me though; I’ve read #1 (loved it) and have 3 & 4 on Kindle….am waiting to purchase #2 and will read them in order! 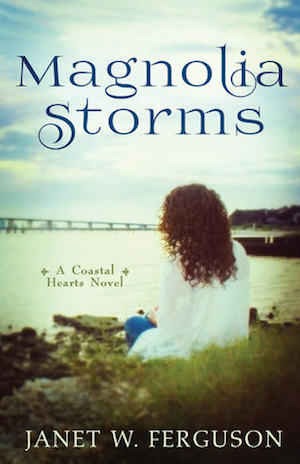 Magnolia Storms was great, too, and I am anxiously waiting that next one, which I think you told me was delayed. Thank you so much for the support, Jackie!! I’m working hard on finishing my next novel!! Thank you for sharing you gift with us…You are an amazing woman. Thank you!! It was great running into you today! You are amazing! I like the backstory of your cover photos! You should just start adding people into the beautiful pictures that you take on your adventures! Thanks, Elizabeth! That would be fun! I don’t have the right camera yet, but I need to work on that. Great to see you here at Inspy! Wow Janet! The covers are lovely. And oh, for a head of hair like your friend. Authors who can pull off doing their own covers amaze me. I may hit you up for advice if I ever cross that bridge. Thanks! I know her hair it great! I’d be happy to help! Beautiful covers with beautiful people. Its exciting that you can find people and a photographer to do it for you. Thank you, Diana! I’m pretty sure it was a God thing! I love how the covers turned out, Janet! I’ve never listened to an audiobook, but I’d really like to try one. So many people say they love them. It would be fun to win a copy of yours! Throw my name in the hat! Thank you so much, Winnie! Audio books are great in the car or doing housework! I’ve got you in the drawing!